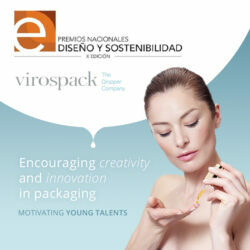 This advanced design was actually a stock package of supplier Virospack. The vial’s glass is frosted. The DuoMix cap containing the powder chamber is made from low-density polyethylene. It has an aluminum outer shell and a polypropylene press button. The applicator cap is made from low-density and ultra-low-density polyethylene that is flexible enough for customers to squeeze in order to dispense product. When developing the package, Virospack meticulously studied the force it would take for customers to comfortably push the cap’s button in order to break the seal. The company also needed a seal material that could be easily broken. At the same time, both the seal and the press button had to be resistant enough to pass vacuum testing. The seal also had to be impermeable to keep air from oxidizing the powder. Each 7-ml vial should be used for only one week to ensure ultimate product efficacy. Six vials and six applicator caps are included in a pearlescent rectangular setup box supplied by Knoll Printing and Packaging. “Because you need to hold onto these packages for an extended period of time, the setup box provides a hygienic place to keep everything”, says Spruance. 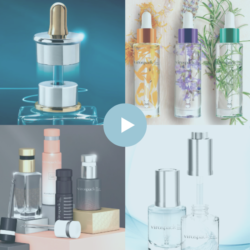 “Seeing all the products lined up in the setup box gives you a sense of a regimen,” says awards panelist George Kress, vice president of corporate package innovations for The Estée Lauder Companies. “It immediately speaks to technology and science,” agrees panelist Dennis Furniss, vice president of strategic branding and design for design firm Kaleidoscope. “It’s right on the mark,” says panelist Paul McLaughlin, creative director for Liz Claiborne Cosmetics. Clinique’s Derma White skin care line features some of the brand’s most technologically advanced products. 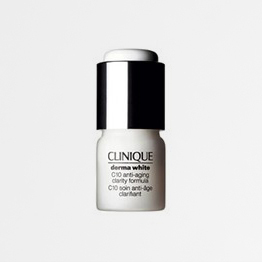 Derma White’s C-10 Anti-Aging Clarity Formula is especially complex. Its skin-brightening formula contains 10% vitamin C, a highly effective but unstable ingredient. “Vitamin C has a pretty short shelf life during which it remains active in a formula,” says Beth Spruance, vice president of treatment product marketing for Clinique. “Our target customer, the Asian consumer, knows that vitamin C is delicate, and we wanted to make sure she got it in its purest form.” To keep the vitamin C separate from the rest of the liquid formula until the time of use, Clinique designed a sophisticated glass bottle with a chambered cap. “The powder is kept in a separate chamber in the cap, and the liquid is stored beneath it in the bottle,” explains Ted Owen, Clinique’s vice president of packaging. “When you press a button on top of the cap, it acts as a plunger that presses down and breaks the chamber’s seal, releasing vitamin C into the liquid.” Customers must then shake the vial to mix the two parts. The chambered cap is then replaced with another applicator cap.